Time really flies when you are having fun :) What am I blabbering about? Time flies period! I feel like I just celebrated Syawal of1430 last month..O well..So far, Ramadhan has been really quiet and peaceful for me. I like it :) This Hari Raya, I told my mother not to make anymore baju kurung for me. I have too many baju kurung that I hardly wear. My clothes hanger collapsed the other day. It's a sign..stop all clothes shopping! I am taking this opportunity to wish all my friends and relatives SELAMAT HARI RAYA AIDIL FITRI. 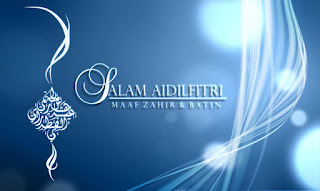 MAAF ZAHIR BATIN!. I seek forgiveness from all of you. To those who will be driving this Hari Raya, please becareful and drive safely.